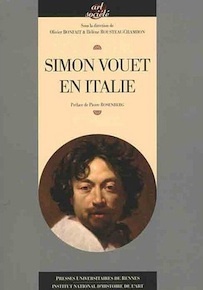 The proceedings from the Simon Vouet colloquium in Italy organized at the same time as the remarkable exhibition by Dominique Jacquot and Adeline Collange at the Musée des Beaux-Arts in Nantes  were published recently and are just as fascinating. This retrospective, despite the varying opinions expressed by different persons concerning the works displayed, seems to have generally cleared up a situation which seemed until now confusing. True, not everything has been resolved and many points still remain hypothetical but both for chronology as well as attributions, it appears that a majority of art historians have reached a consensus on many points. The proceedings themselves are divided into four sections. The first one looks at some Northern European artists active in Rome during Vouet’s time and his relationships with them. Here, Gianni Papi discusses Honthorst and points out what ties him to the French painter whom he no doubt influenced, although there is no documentary evidence that they ever met. He also mentions Giusto Fiammingo and Jean Ducamps, reconfirming the latter’s identification as the Master of the Incredulity of Saint Thomas (see news item of 23/12/11). John Gash, on the other hand, departing from the Vouet theme, presents one of the most sensational discoveries of the last few years, Papi’s identification of Ribera as the Master of the Judgement of Solomon. This essay summarizes both the pros and cons of this theory. After seeing the exhibition in Madrid featuring the young Ribera, Gash concludes that several of the paintings among those attributed to the Master of the Judgement of Solomon are indeed by the Spanish painter (notably Christ Speaking with the Doctors of the Church, Saint Peter’s Denial and The Resurrection of Lazarus), but not The Judgement of Solomon itself ! This case will no doubt provoke many more articles before it is finally settled. Erich Schieler is the author, in the second part ("Vouet en Italie, échanges et réceptions"), of an article studying the relation between Lanfranco and Vouet. We would like to look at a footnote here  where Mr. Schieler seems to regret the fact that we attacked him "rather violent[ly]" in our article devoted to the exhibition, concerning his entry for painting cat. 29, An Angel Explaining the Divine Mysteries to Mary Magdalene near Christ’s Tomb (ill. 1) and offers a lengthy explanation. While it is true that our criticism was firmly stated, it was not meant to be violent and we are sorry if it was received as such. Erich Schieler adds that his information concerning the painting’s provenance was taken from Anne Rivoallan’s article published in the Bulletin de l’Association des Historiens de l’Art italien. However, this provenance (the Raggis) is not indisputable, no matter how very likely it is. The work, held in a private collection "comes from a Pallavicini collection in Genoa" according to Anne Rivoallan. But the move from the Raggis to the Pallavicinis is only a probability and has not been proven anywhere. Anne Rivoallan’s strongest clue, making her theory very credible but which is not pointed out in Erich Schieler’s entry, is the presence of a partial copy of this painting owned by the Raggi heirs. In any case, as Erich Schieler admits, this does not prove an attribution to Vouet (contested by many, though the name of Mellin, which we suggested, should be eliminated and is not admitted by Philippe Malgouyres). What we wished to say in our article, and have developed since (see for example here), is that we find it is important that a theory not be presented as being true until it has been definitely proven. This type of scholarly discipline is absolutely vital in the field of art history as, in fact, in all others . We will not detail the excellent text by Philippe Malgouyres on the ties between Charles Mellin and Simon Vouet, except to note that the author believes that Mellin contributed to several important Roman commissions received by Vouet, notably the large modello for Saint Peter’s in Rome today elsewhere, and the ceilings of two chapels painted by Vouet, San Lorenzo in Lucina and San Francisco a Ripa. 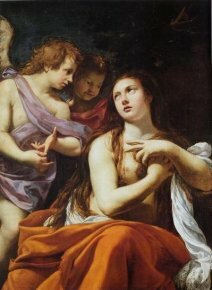 This theory is also presented in the following essay by Viviana Farina who looks particularly at Simon Vouet’s trip to Genoa. 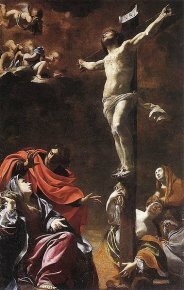 Another point developed by Ms. Farina is a later date for Vouet’s Crucifixion (ill. 2) from the church of San Ambrogio in Genoa (1624-1626, rather than 1622), a correction which is generally accepted today . We should remark, however, as stated also by Dominique Jacquot in the concluding article for these proceedings, that questions of dating for Vouet’s Italian works cover a short period of five years. This no doubt calls for very cautious statements concerning chronological questions. The second part of this volume closes with an article by Alessandro Morandotti on the connection between Vouet and the Lombard school, notably his very short stay in Milan where he met Giulio Cesare Procaccini, as well as the stylistic affinities with Francesco Cairo and Daniele Crespi. The third section, "Vouet dans les cercles artistiques et intellectuels romains", examines iconographic problems and literary associations (L’Allégorie chez Vouet. Paradoxe et propagande dans le cercle des Barberini by Karen Serres and Vouet et le milieu des lettrés autour des Barberini par Olivier Bonfait), as well as the everyday life of artists in Rome in the first half of the Seicento as garnered from the sometimes amusing anecdotes found in archives (article by Patrizia Cavazzini). But the longest and one of the most fascinating essays in these proceedings is by Stéphane Loire who offers a very thorough and detailed review of the exhibition itself, also extending his thoughts to Italian paintings by Vouet which could not be presented in either Nantes or Besançon. More than just a simple critique, the author provides us with a veritable summary of Vouet’s career in Italy taking into consideration the retrospective’s new findings, whether or not he accepts certain of the proposals. The last part, entitled "Appendices Vouet", includes, besides Dominique Jacquot’s conclusion, three short articles by Olivier Michel, Arnauld Brejon de Lavergnée and Guillaume Kazerouni. The first, which regretfully and unexplainably presents no illustrations (despite the references to the nonexistent fig. 1 and 2), seems to solve an enigma which has intrigued art historians for a long time : the identity of the famous Maestro Jacomo, responsible for one of the paintings in the chapel of the Passion in Santa Maria in Aquiro, attributed to Trophime Bigot for many years. In fact, this would appear to be, according to Olivier Michel who provides documentary evidence, by Jacques Casell, a painter born in Marchiennes near Douai, in 1585 and who went to Rome to work. This would make him a fellow countryman of Jean Ducamps and Nicolas Régnier who were born respectively in Cambrai and Maubeuge. Arnauld Brejon de Lavergnée publishes a Portrait of a Young Woman as Saint Catherine, residing in a private collection in Naples as well as a drawing recently acquired by Chicago and which we will discuss soon when presenting this museum’s latest acquisitions. Finally, Guillaume Kazerouni studies several versions of a composition of Judith and Holofernes painted in Simon Vouet’s circle. In concluding this article , we thought it would be interesting to present below a chart summarizing all of the remarks concerning attributions for the paintings in the exhibition as reflected in the three major reviews, that of Stéphane Loire in the proceedings, that of Arnauld Brejon de Lavergnée in The Burlington Magazine (no. 151, 2009, pp. 187-189) and that of Moana Weil-Curiel in Les Cahiers d’Histoire de l’Art, no. 7, 2009. We have considered only those paintings which received at least one comment rejecting or qualifying the attribution to Vouet. We can also say that Dominique Jacquot now believes (which he had told us and confirmed again in the colloquium proceedings) that cat. 23 (Saint Andrew) is not by Vouet. Under the supervision of Olivier Bonfait and Hélène Rousteau-Chambon, préface de Pierre Rosenberg, Simon Vouet en Italie, Presses Universitaires de Rennes / Institut National d’Histoire de l’Art, 2011, 291 p., 24 euros. ISBN : 9782753513648. See the review on this site, then the article covering the third day of this colloquium which was held at the exhibition itself and, finally, our interview, in french, with Dominique Jacquot. Let us look for example at the proceedings from the colloquium which Gianni Pap publishes on p. 30 (figure 12), a Saint Matthew and the Angel with the legend "Nicolas Régnier". Now, as pointed out in a footnote, Annick Lemoine, a specialist of this painter, rejects this attribution. It would have been much more appropriate no doubt to write in the legend, "attributed to" or "attributed here to" Nicolas Régnier. The work was not presented in Nantes or Besançon. In reference to the exhibition in Nantes and following events, we would also like to point out the articles by Sylvain Kerspern on his site, D’Histoire et d’@art on some aspects of the show (the portraits, the chronology...). This author also told us that for cat. 49, Saint Catherine of Alexandria (see news item of 18/9/06 in French), he held some “doubts especially in its present condition, after its restoration”. We did not include this work in the chart as Moana Weil-Curiel’s opinion was not explained clearly in his article and that the other two authors do not find cause for doubt in the attribution. Mail from 2/1/12. In the Burlington Magazine, Arnauld Brejon de Lavergnée wrote : « Rightly restored to Vouet by Jacquot ». Arnauld Brejon de Lavergnée, in his e-mail from 2/1/12, tells us he never believed in this attribution. In the Burlington Magazine, he only said the reproduction was reversed.